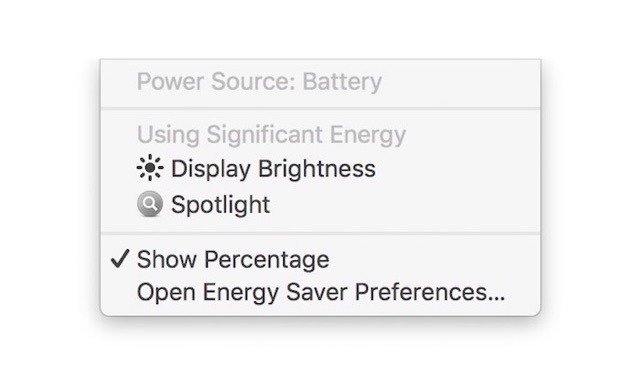 Released to testers last week, the fourth macOS Sierra 10.12.3 beta adds "Display Brightness" as one of the options within the battery menu. First spotted by MacRumors, the warning only appears if the MacBook is set to a display brightness above 75 percent, with it unavailable if the user has selected a lower brightness setting. Clicking the Display Brightness warning will automatically lower the brightness of the screen down to 75 percent. The setting also reduces down to 75 percent if the beta is installed on a MacBook with a higher brightness level already set. The new option expands the usefulness of the battery level, which already warns users of apps that are drawing significant amounts of power. The USB-C based 2016 MacBook Pro has received stiff criticism since its launch, with some owners complaining about a lower battery life than anticipated, though Apple apparently has not seen any real trend in battery issues. As Apple uses 75 percent as the setting for its own battery life tests, it is plausible some who tend to go brighter may see power durations get closer to what they expected using the setting. Battery life issues have also affected Consumer Reports, which recently changed its stance and is now recommending the new MacBook Pro to consumers. After failing in the initial tests and the discovery that a hidden setting in Safari affected battery life, the product testing group tried again using a macOS 10.12.3 beta, with the software changes preventing the unexpected battery drain.